The Central and North Burnett is a real contrast to the coastal parts of the region. Rugged gorges, imposing mountain ranges, serene rural views, the Burnett River and towns offering country hospitality. Take the circle as a side trip or travel through the district on the Burnett Highway (17) as part of the alternate route from Brisbane to Rockhampton. Craggy blue ranges are the backdrop for Biggenden. Along with agricultural pursuits; beef, peanuts, dairying, piggeries, citrus and timber the area is rich in minerals. Magnetite is used in the washing of coal and is mined near Biggenden. Inspections are by arrangement with the management. 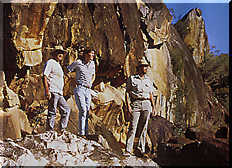 Coongarra Rock is a single formation which affords inspiration views of the surrounding mountains for the adventurous. It has restricted vehicle access with the turn off about 8 kilometers south of Biggenden. Mt. Walsh (645 metres) and the Bluff are two prominent peaks in the district. The park is undeveloped and suitable for keen experienced bush walkers and climbers. Queensland's oldest town, Gayndah was once in the running with Ipswich and Brisbane for the state's capital. Originally settled in the 1840's as sheep country, it wasn't until 1892 the William Seeney planted the first orchard. Today Gayndah oranges are famous and an export commodity. The historical museum features one of the oldest Georgian Cottages in the state and has a unique collection of antique farm equipment in working order. Eidsvold's past can be seen in the slab homestead "Knockbreak" built in the late 1850's and part of the Eidsvold Historical Complex. There is a "Railway Siding" with examples of rolling stock and cottages, the Duncan & Shultz collection of bottles, pioneering tools and memorabilia and the George Schafer Collection, a superb display of one man's lifetime collection of rocks, gems, bottles and unusual items. Spectacular sandstone cliffs similar to Carnarvan, lush rainforest with tree ferns and piccabeen palms growing along watercourses and dry gorges and dry open eucalypt woodland make this park well worth a visit.